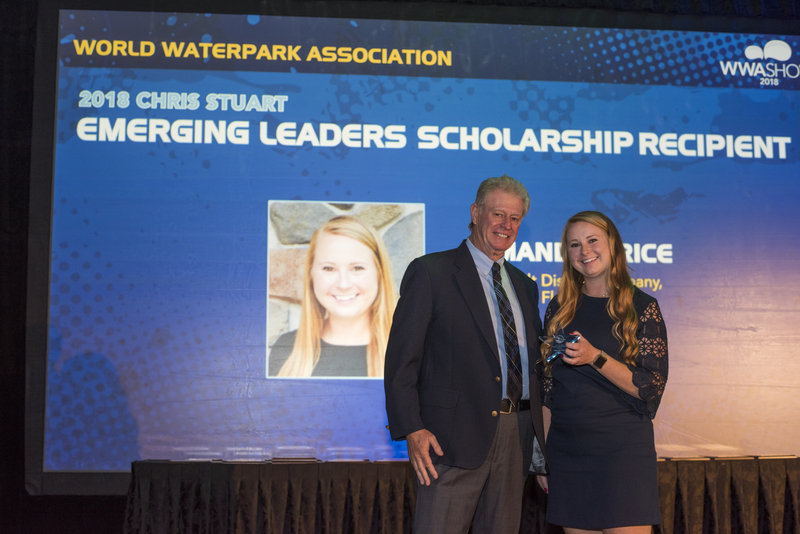 The Chris Stuart Emerging Leaders Scholarship Program is meant to give individuals who are under 35 and have less than 5 years in the water leisure industry in a non-managerial position at a seasonal or year-round facility or are students enrolled in college the opportunity to attend the WWA Show at little to no cost to them. This scholarship is named in honor of Chris Stuart, a WWA Hall of Fame member who was known for his kindness and generosity in mentoring those who worked for him and were coming up in the industry. Stuart’s prolific career included time at parks and companies located throughout the world, as well as service as a member of the WWA’s Board of Directors and he was a recipient of multiple Board Awards. To learn more about Stuart and his contributions to the industry, click here to watch a video. The application window for the 2019 scholarship will open in June 2019. Please check back for an application form. One full scholarship will be awarded in 2019. The recipient of the scholarship will receive a plane ticket to travel to the WWA Show (Up to $500 value), three nights covered at the headquarters hotel (Up to $600 value), a $50 food and incidentals per Diem for up to four days (a $200 value) and a complimentary Symposium Package registration (value to be determined). Should a recipient be unable to attend, the scholarship will pass to another candidate. There is no cash value for this scholarship and is only intended to allow a recipient to attend the WWA Show. The recipient will also be introduced to various industry leaders and dignitaries and recognized during the Opening General Session. Working in a part-time or seasonal position at a waterpark, pool or aquatic center or attending college as a full-time student. Being a current Emerging Leaders Members is not required in order to apply for the Emerging Leaders Scholarship, however current EL Members will be given first consideration. Click here to learn more about the EL Membership or to join. For answers to questions or for assistance with registration, please call +1-913-599-0300. 2013 full scholarship recipient: Justin Blair, Geyser Falls and Clearwater Key Water Theme Park.